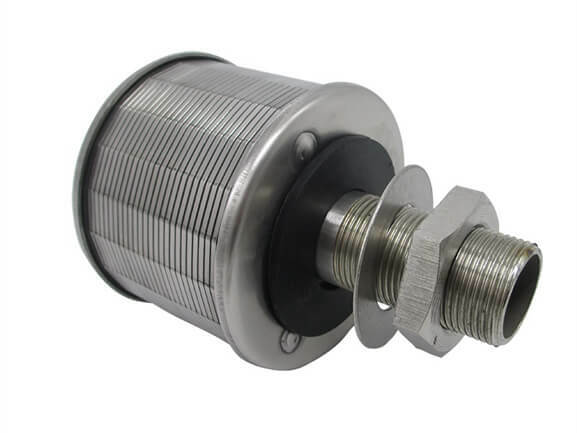 Thread: M, NPT, GBS.P, external thread, the internal thread, no thread, etc. Filter nozzle is widely used in water treatment, its stability is very good at work. What are its characteristics? How to choose the right product? How to distinguish the quality? what is our advantage? You will get the answer from the article below. Filter nozzle can be used in the filter equipment for the filtration of water, petrol resin, and other media. It can be also used in water treatment, water soft, conversion of sea water into fresh water, the filter of food chemistry and other filter industry. 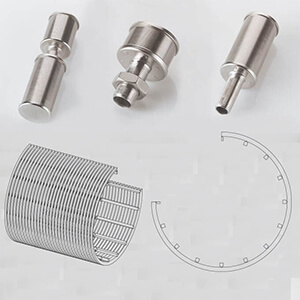 Filter nozzle is welded together in a special way with wedge wire screen, threaded rods and steel plates, due to the application of the wedge wire mesh and the V-shaped slot, the filter nozzle is difficult to be blocked by the filter impurities. 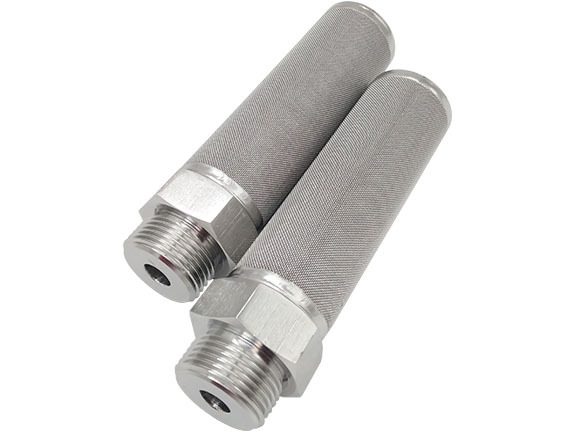 It is mainly used in the water treatment industry, so it is also called water treatment filter nozzles. 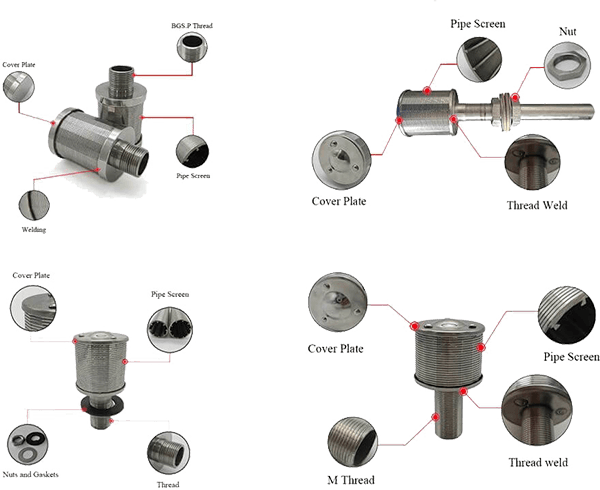 Why choose a stainless steel filter nozzle? 1. 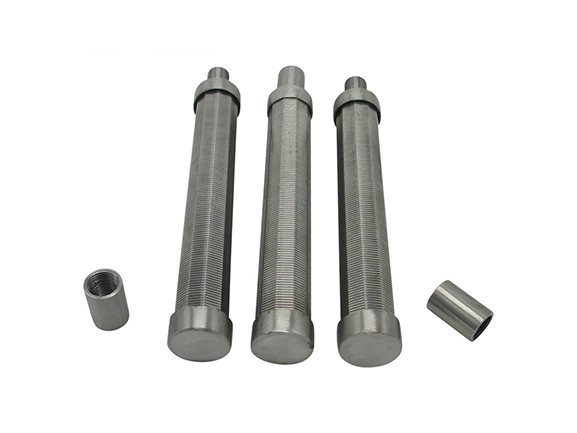 There are many kinds of materials for producing filter nozzle, ABS, PP and stainless steel. 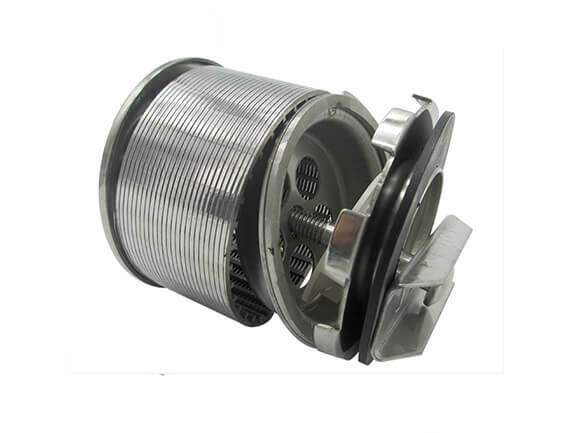 Stainless steel filter nozzle is a new generation of water treatment filter. It is also our most advantageous product, compared with the old-fashioned ABS/PP filter nozzle, it has obvious advantages in strength, pressure resistance, temperature resistance and aging resistance, solved the troubles of many customers in the process of use. 2. When your filter media contains wax, asphalt, and high viscosity fluids, don't hesitate, be sure to use a stainless steel filter nozzle, Its advantage is irreplaceable. 3. In terms of price, many customers report that the unit price of stainless steel is higher than ABS/PP. This is true, but because of its long service life, can be reused by backwashing, and it is safer and more reliable, so the cost performance is far higher than the other materials. 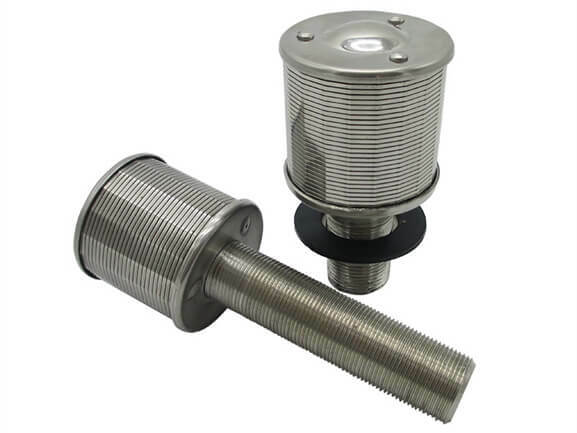 Therefore, the stainless steel filter nozzle will play an increasingly important role in water treatment. 4. We have the most advanced filter nozzle production equipment and finished cleaning equipment in the industry, which can process various specifications of products for you. 0.25 tons / hour, 0.5 tons / hour, 1 ton / hour, etc. Long handle, middle handle, short handle. 1. High strength, metal structure, strength is greater than ABS/PP material. 2. Slot size high precision. 4. High slot open area. The high opening rate can meet the requirement of large flow. 5. Advanced production equipment ensures that the slot size error control of the product is far higher than the market level and meets the higher requirements of customers. This is why our products are highly evaluated by customers all over the world. 7. Long life, resistance to corrosion and high temperature (>135°C), Very low maintenance costs, long-term cost performance is much higher than other material. 9. It is easy to install and can provide relevant technical support. 10. ZHEHAN®'s self-developed cleaning equipment, unlike ordinary pickling, not only makes the water cap look bright but more importantly, it improves the corrosion resistance by 40% and prolongs the service life of the product. 11. Provide customized services. 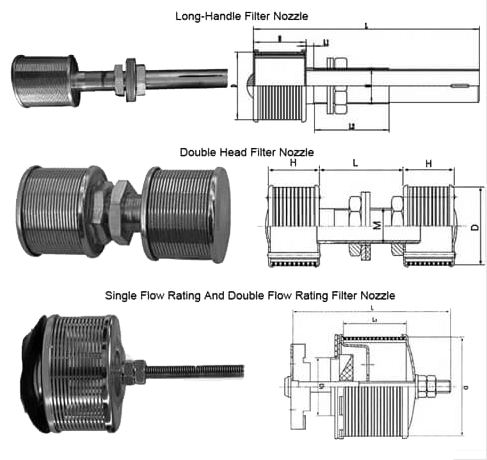 We rely on a strong technical team and years of sales experience to produce filter nozzle products of any size. 1. Logistics and delivery time. Logistics: According to customer requirements and the number of goods, the most cost-effective transportation method is adopted.Including ocean shipping, air transport, International express. And the after-sales service specialists regularly inform you of the logistics status of the goods. Delivery time: filter nozzle is our main product, we have a large inventory of conventional products. For products that require customization, we will send your samples first and will ship them about 15 days after confirmation. 2. Are you filter nozzle manufacturers of trader? We are a manufacturer with a factory area of over 7,000 square meters, we have modern production equipment such as CNC machine tools, molybdenum wire cutting machines and laser welding machines. 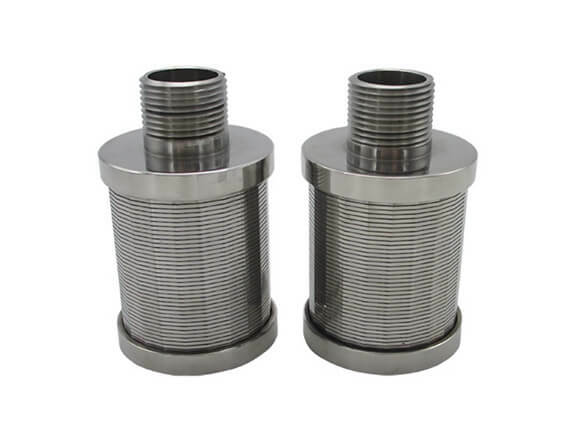 Filter nozzle is our main product, we are the earliest manufacturer of stainless steel filter nozzle strainer in China, and our customers all over the world are always welcome to visit the factory. 3. What if your filter nozzle has quality problems? First of all, our product quality control is very good, our factory has a complete quality management system, about the filter nozzle, from the collection of raw materials to the finished product, more than ten processes, each process has a special quality inspector to carry out quality inspection. Our corporate culture is the craftsmanship spirit and the pursuit of product quality, so please believe in our brand. Of course, sometimes there may be individual quality problems. We have a perfect after-sales service system. If you find a product with quality problems, we will exchange the goods for you for the first time, and all the expenses will be borne by us. 4. I don't need a regular product, can you process custom? Yes, we have a wealth of experience in filter nozzle production, a strong technical team, we only need to provide drawings or samples to make the products you need.